​updated while still retaining it’s old world warmth and charm. on a new foundation in order to subdivide the huge acerage it sat on. This move allowed all the plumbing and wiring to be updated, and bathrooms added. As a result the Manor now offers modern comforts wrapped in it’s historic charm. The grand staircase leads to the guest floor with it’s four guest rooms. The manor features two spacious King sized bedrooms and two Queen rooms. Each bedroom includes an ensuite bathroom with either a clawfoot tub or a shower. There is an additional apartment suite on the third floor which features two bedrooms and is ideally suited to a group of 4-5 adults. The apartment has a small kitchenette, living room and a shared bathroom. be set up with 2 King beds, 4 Singles, or a combination. Guests are welcome to enjoy most areas of of the main floor and all the outdoor areas of the house. 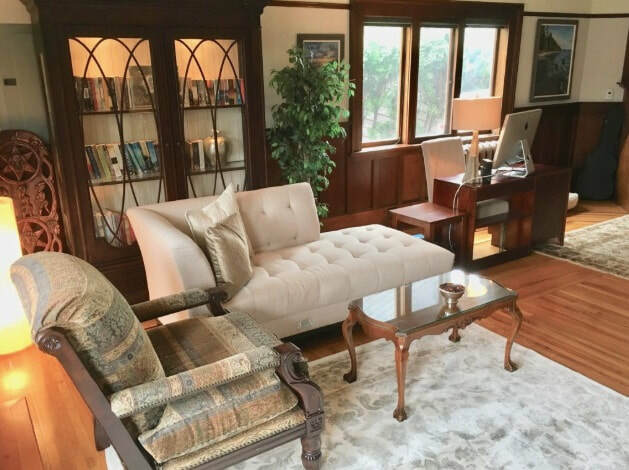 There is a lovely cozy guest lounge with a fireplace, library books, games and puzzles. The dining room has an all day coffee, tea and snack centre that guests are welcome to help themselves to. And the outdoors spaces include both front and back of the house. The large turn of the Century Porch is a delightful spot to sit and read the paper in the morning with a cup of coffee. The back garden is private sanctuary shaded by three massive Maple Trees and offers a lovely cool retreat on summer afternoons. purchase and to mingle with other guests. theatre, meeting room or functions area. Please feel free to enquire about this as an option. 4 Place setting of plates, cutlery, and glasses. Air Conditioning, Heat, and Ceiling Fans.